One of the works in Tom Climent’s exhibition Aspect is titled, perfectly, Magic Mountain, evoking Thomas Mann’s classic novel of ideas. The main protagonist’s seven years spent in a sanatorium in the Swiss Alps, high above the “flatlands”, opens up a world of infinite speculation and possibility, before an ominous return to the conflict below. Mountains are the dominant motif in Climent’s paintings, which are built around the meeting of organic and geometric forms. The latter mostly comprise brightly coloured, geodesic dome-like constructions, angular peaks that seem to grow from or are smoothly incorporated into natural masses. The idea of construction and bold colours encourage a playful, inventive reading of the imagery, as though we are looking at ideas in the form of building blocks. Climent manages to set up this framework without being too illustrative about it, so that he allows for space for the viewer’s imagination to dream or even soar like Mann’s Hans Cartorp when he arrives in the mountains. It’s Climent’s most successful synthesis of abstract and representational elements to date and is an important show for him. Aspect continues Tom Climent’s exploration of the diminishing boundaries between landscape and abstraction by travelling further into fictional terrains of hybrid mountains, hills, uplands and plateaus. In previous groupings these features of the temperate Irish countryside seemed in harmony with Climent’s colourful and architectural interventions. This selection for the Solomon suggests a moment of separation between these two elements, a kind of fission that triggers the release of energy into the atmosphere. This activated geography is a less hospitable place that radiates arid heat and heightened artificial colour. Paintings that seemed clement before such as Gimle and Andlang appear to have been scorched in the company of newer works such as Follower and New Life. Climent describes New Life as the centre piece for the show and it could be the culprit underpinning the cause of cataclysmic change in other works. It captures the detonation of an explosive lift off or landing, of one of Climent’s hybrid peak structures. This mountain is wider, more jagged and its somewhat ungainly appearance is emphasised by the dusty matter billowing out from underneath, possibly from the impact. Climent’s facility for painting renders the powerful downdraft sublimely, sending clouds of purple and orange powdery material floating upwards. Set on a fertile hill-top the contrast between the pastoral location and its strange geometric modifications is now stark, signifying rupture or, less brutally, a leave-taking. Either way it has pushed the narrative closer to science fiction and loosens the painting conventions that previously tethered Climent within the limits of landscape painting tradition. Similar in narrative to New Life, Magic Mountain pulls itself away from its hill-top position more successfully spilling expanses of orange and blue paint that are pulled and scraped down into a dark pool of ultramarine. The depth of field here is deliberately confusing invoking the viewers sense of spatial perception and triggering an unconscious impulse to enter the virtual world of the painting to investigate the nature of its three dimensionality. A conjoined set of mismatched dwelling structures with elevations of pinks, browns and green are set into the mountain at its highest point. Whether by design or because of the mound’s upward thrust they lean perilously forward and echo the awkward posture borne in New Life. Follower takes an epic view of Climent’s otherworldly landscape and bathes it in a luminous array of hot orange, lilac and pink. A mountain hidden from view casts a long purple shadow in the middle ground suggesting nightfall arriving. Its effect is to deepen the perspective and heightens the drama of the searing heat and golden light. The surface of Follower is rich in textures and layers of painting that remain visible through one another. The result is a shimmering work of unique depth and life. The abundant poetry in Climent’s painting is partly a result of his use of the traditional and romantic format of landscape painting combined with the sheer visual pleasure in his rich colour palette. Embedded in these conventions are the heretofore mentioned strange and eccentric elements that give away his self-critical processes of checks and balances. What stands out is his carefully mined and wonderful glossary of titles for his works, with gems such as Gimle, Alfeim and Andlang. Giving titles to paintings could be a hard-won phenomenon of concrete poetry. It is no elementary task to take the topographical shape, onomatopoeic sound and etymological origin of a word and somehow match those elements with each other and a tangible work of art. It is an unusual and appreciated delight to enjoy the titles of these works while enjoying the works themselves. This attention to detail testifies to Climent’s commitment and value as an artist, as much as his accomplishment and ability to paint. Cork-Based painter Tom Climent has been honing his approach to abstraction for more than 20 years. This show which features fantastical landscapes in which mountains and rocky outcrops take the form of multifaceted geometric structures. They sit under pink, purple or turquoise skies, jewel-like, in shades of cerise pink, green, orange, blue and golden yellow. Climent is a remarkable colourist. His work is quietly uplifting, even spiritual. It offers a glimpse into another beautiful and majestic dimension. The paintings have one-word titles. Plume features a shape like a cluster of colourful crystals, a rare geode in an alien vista. Butte and Mantle show a pair of rounded boulders. Andlang depicts a more traditional mountain-scape, seen through an entirely pink lens. Climent uses sand and plaster to give texture to the surfaces. There are no intimations of buildings in this show. These rainbow crags seem to have been sprung from the artist’s imagination but feel real, unidentified places that appear ancient and new at once. Strong, inspirational painting from one of Ireland’s best abstractionists. Tom Climent’s exhibition, ‘Latitudes’, at Dunamaise Arts Centre, Portlaoise, was described in the gallery text as “investigating the boundaries between abstraction and representation”. Climent presented twelve roughly similar landscapes featuring a central mound, peak or outcrop on a slightly higher-than-centre horizon line. While these compositions fall within the recognisable tradition of landscape painting, the artist’s synthetic colour palette, along with occasional architectural additions, serve to unsettle the familiarity that the genre normally fosters. Perhaps Climent’s expansion of this disciplinary boundary is less focused on stylistic approaches and more concerned with how the viewer rationalises personal expectations of painting. It helps that they are beautifully executed and bridge real and imaginary worlds. Climent’s disorderly arrangement of planes, vertices and edges are softened by his hand –drawn outlines, textured surfaces and luxuriant use of colour. Caprock (2017) resembles a burial mound located in a flat upland position, rather than on a hilltop. Climent presents a slightly flattened isometric view, allowing the front elevations and foreground to be shaded from ambient light, illustrated through blocks of violet, purple, maroon and brown. The vertices and points of intersection are more cleanly defined, while the flat areas are more textured, revealing layers of underpainting and plaster. Over these coarse areas, patches of luminous colour brighten the scene, despite a dull sky. In this way, Climent manages to avoid the risk of over-boiling his intense colour range or overreaching the narrative between his key influences of archaeology and science fiction. The rock formation depicted in a larger work, Berg (2017) slides at glacial pace from the horizon as it’s bulk casts a deep shadow on the hillside. Conversely, in Mountain Mind (2017), liquid matter spills from a huge opening in the mound, flooding the ground around it. The relationship between the subject and this sense of continuing motion serves to widen the narrative possibilities beyond the picture plane. This interaction also reveals the technical and conceptual struggles between being faithful to intuition (without over indulging) and producing good painting. Two works, Alfuen and Gimle, presented side-by-side in the gallery, more explicitly disclose how personally compelling the making of this work might be. Both paintings comprise sharply pointed mountain peaks whose apexes are hewn with the same distorted harlequin edifice. The downward slopes that fall away from the peaks gradually soften into a more natural appearance. The viewpoint is paradoxical, only possible by being elevated in flight. There is a sense that these mountain peaks stem from innate memory or knowledge – in the way that ringforts are involuntarily etched onto the collective Irish consciousness. Sometimes a sense of familiarity has no identifiable origin, while ideas are unbound by pure representation or abstraction. These intangible qualities permeate the materiality of Climent’s painting. His compositions are neither wholly real, nor completely fictional and most importantly, they offer no easy resolutions. His work remains open, generous and evolving, demonstrating great investment of skill and vision. By neat coincidence, the arts centre’s namesake, the Rock of Dunamaise, stands less than five miles away, surrounded by the seven hills of Stradbally, so I imagine that local audiences actually felt very at home looking at this work. Carissa Farrell is a writer and curator based in Dublin. The sun, that 4.6 billion-year-old, far-away ( 149 million kilometres away ) burning star, and now 300 degrees hotter than it was when it was born doesn’t always deliver. Irish summers are hit-and-miss; ones, when the sun shone all the time, are still remembered. 1976 was good. On 29 June that year Boora, County Offaly, saw 32.5 degrees Celsius, the highest recorded 20th-century temperature on this island. Climent loved both science and art at school. “One, based on logic, structure and reason, the other embracing chance, spontaneity and accident.” Later he abandoned engineering for art. From large “gestural, figurative, expressionist” paintings he realised, aged 30, that “shape, structure, colour” would be his focus. “I made a deliberate effort to try and work small and contain the energy I was trying to convey, to structure the work in a much more deliberate and controlled way”, he says. This image, Meridian, took months. No hard-edge here. The canvas is alight and, using liquid gold leaf, “a distillation of the glow of the sun.” Climent’s creation glows with a beautiful and glorious warmth. Tom Climent is an archetypal ‘painters’ painter’. His work evolves from an intensive process of constructing and de-constructing surfaces, until a harmonious balance of colour and texture is achieved. And like any artist who pays serious attention to the tactility of paint, Climent’s work firstly captures the viewers’ attention from a distance and then rewards that interest, when the work is studied up close. Such fidelity to the painted surface is not to suggest for one moment that Climent is defined exclusively by his repertoire of painterly skills; or that he appeals only to fellow artists. These paintings will captivate the public just as much as the art establishment. There is a beguiling universality at play, where the paintings shimmer with an ethereal glow and inner world that resides behind the picture plane. This world is full of uncharted spaces on the cusp of discovery. We drift from place to place, disoriented by the oddly familiar, soundtracked by an unfamiliar Space Oddity. Crucially, it is this ability to construct images that are evocative of some unnamed place from an undetermined time, which draws the viewer ever deeper into the sonorous depths of the artwork. A penumbral mist conceals details and features in these ‘landscapes’, adding an old-world patina or glow that belongs to a much older era (notwithstanding the modernist aesthetic that keeps the work relevant to contemporary tastes). Climent’s working process evolves from analysis of geometric shapes – be they cuboid, pyramid or dodecahedron – and from there, experimentation and serendipity takes over. Lines and planes within the limits and laws of perspective collide like fractals, melding together to anchor the structure – on top of which, paint clings like magnetic quicksilver. But these structures morph into something much more beautiful and lyrical than even the most tantalising of mathematical equations. The central structural motifs that populate each painting are connected, sharing similar traits and inferences. For the artist, these structures can evoke a metaphorical symbolism – such as a bowl, vessel shape or languid pool. The ground underneath could be a courtyard, with hazy mountains in the background, swathed by the effects of aerial perspective. But Climent feels that these are places of refuge – a cabin or bothy for the weary traveller – or perhaps a sanctuary for the hermit to escape blizzards of urban white noise. But the artist is refreshingly egalitarian, happy for the viewer to see what they like in the imagery. The irresistible urge is to accompany the artist/explorer on his journey, to navigate the maze by finding a route guided either by the pearlescent dawn or the smouldering twilight. Through this iridescent countryside, each painting is a site to rest and take in the view, until eventually, we arrive at ‘a place found’ (to borrow a title from a 2014 exhibition). Painting can be a cruel and unforgiving process when the materials are uncooperative, or when an artist faces a crisis of confidence. Conversely, paint and colour can easily yield when a rhythm is found. There can be little doubt, that on the strength of this exhibition, Tom Climent has not only found his rhythm, he has well and truly arrived at his destination. Mark Ewart lectures at CIT Crawford College of Art and Design. He is also an art teacher, writer and artist. The glorious gardens of Liss Ard Estate in Skibbereen boast James Turrell’s Sky Garden, arguably the most spectacular piece of public art in the country. This summer there’s an additional reason for art lovers to visit – a large and impressive exhibition by Tom Climent. He’s yet another Cork artist whose work is inclined to blush unseen due to the recent closure of the city’s two commercial galleries – the Fenton and the Vanguard. Climent’s initial momentum – through a much-vaunted graduate show, followed by various awards, including the Victor Treacy and Tony O’Malley prizes, and a number of successful solo shows – has slowed somewhat. This exhibition should help propel him back to the front ranks of Irish artists. The bright and airy spaces of the beautiful Georgian building provide an ideal setting for this most painterly of painters. The shapes and structures in his paintings are the stages on which his sensual colours dance. Gorge your eyes on paintings such as Groundwater and Mantle, where luxuriant purples, greens and blues disport themselves around their ectoplasmic scaffolding. Tom Climent has built a solid reputation for paintings that seduce the eye, and compositions that smoulder with theatrical tension and atmosphere. The energy and expressiveness of early work has come to be replaced by a calmer and more contemplative mood, as the artist now utilises subtle layering of muted colour and texture. Indeed, this collection of oil on canvas paintings suggests the artist is at his peak. Climent’s subject matter centres on anonymous architectural forms that rest within spatial environments that are correspondingly indistinct and remote. The structures imply a fortress or barricades devoid of any sense of human presence. Any such urge however to apply a rational logic to these paintings and turn them into recognisable subjects, is in ways, not part of the deal. First and foremost they are a celebration of shape and colour and in purely sensory terms, Climent’s paintings are not unlike the colour-field abstraction of Joseph Albers or Mark Rothko. The main difference being the artists’ trademark ‘flatness’ is folded by Climent into a representation of solidity through a series of intricate, origami manoeuvres carried out by some unseen force. This notion that a higher power rendered the forms that Climent paints, seems oddly appropriate, as there is monumentality to the relatively larger works on show. When these structures soar upwards — especially in the beautiful Haida — they scaffold tantalising flashes of iridescent colour that draws the eye to their pinnacle, making the paintings seem not only older, but even larger than their modest dimensions suggest. In April this year, I took part in an Ask the Artist event at the Luan Gallery, Athlone, with artist Tom Climent. We sat in the gallery with an audience and engaged in conversation about his exhibition, Vessels, and wider his practice as an artist. Following this we corresponded by email for this article. In the early 1990s Climent had been studying engineering while taking night classes at the Crawford College of Art with the late Jo Allen whose influence encouraged him to go further. In his third year of engineering he left to pursue fine art full time. In the short time I have known Tom (but known his work for many years) I have sensed in him a journeyman approach to being an artist. His description of his own beginnings as an artist tells a story of a man with a primary need to derive meaning from his labour and for his labour to provide the means to exist. This old fashioned Marxist principle doesn’t really fit the traditional notion of achieving success as an artist but Climent’s journeyman work ethic is resolute and unassuming; in his final year of fine art he found a studio outside of college where he continues to work today. He recounts unequivocally ‘I suppose I had a clear idea of what I wanted to do when I graduated. I wanted to have a studio, organise exhibitions and try and get my work known to people’. It’s hardly the fame and fortune sought by many artists – more an achievable path with steps that would provide him with what he needed to feel solid and grounded in his work and life. Climent describes everything about his practice with a considered modesty and openness. ‘I suppose I was lucky as well when I left college…Looking back now I didn’t really appreciate how great these things were to have happened. I suppose I took them for granted, I think in retrospect when you have success early on you assume that this will always happen with your work, of course it doesn’t. The years after this I became complacent I think, I didn’t really make enough of the chances that had been given to me. In hindsight I didn’t really look after my career well enough after achieving that initial success’. In an earlier email I had asked him to pinpoint key moments in his development/identity as an artist and he very quickly referred to this period negatively. But he also recognised it as being a kind of turning point that propelled him into a new phase. He changed his work both deliberately and radically unfortunately with the result being initial dissatisfaction. However over time he found balance between his old and new practice, and it was at later, around 2003, that things began to really happen for him outside the studio. ‘It was a really successful show, all the work sold and it enabled me to move to Spain for a while then the following year…Most of the work I had done previously was large in scale, I hadn’t been able to paint less than 4 feet in size, I’d tried but couldn’t get them to work. Out of practical reasons I started painting small in Spain, I had no separate studio but painted on the roof terrace of where we were staying. These small paintings predominately were abstract in nature but alluded to a space or structure. This has been an overriding theme in my work since then’. Climent continued to show with the Fenton gallery until its closure, and looks back at his time with the gallery as really positive. He now shows with the Blue Leaf Gallery run by Ciara Gibbons who has brought his work to art fairs in Canada and the US, resulting in representation by the John Cacciola Gallery in New York. Despite strong support and private representation, it emerged during our conversation at the Luan Gallery that he has felt the impact of the difficult commercial conditions that have prevailed in Ireland over the last five years. I asked him about his dealings with the non-commercial/public sector and other opportunities for funding/income. Initially in the 1990’s Climent sought Arts Council support but was unsuccessful and very diplomatically concedes; ‘( I )I felt that the work I was doing didn’t meet the requirements they were looking for. I was engaging more with commercial galleries and I suppose that was where my work was best placed’. More recently he has had some success, with solo shows in many public spaces, as well as a Cork City Council Bursary for 2014. A question that always preoccupies me is how an artist maintains their critical perspective while working in isolation. Climent points to discipline as key, the discipline of not becoming complacent or overly self-reliant and the importance of engaging with other artists, curators, gallery owners and collectors so that your view of your work is counterpointed by the views of others. Another method of avoiding isolation is to return to an institution. Climent embarked on a two year Masters in Fine Art in 2009, in the hope of reflecting in a more structured manner, ‘on the ways I had developed of seeing and thinking about my work’. He considers the experience as a contained one, with a start and end, like a repository of research from which he draws continuing influence in his current practice. To gain insight into his internal process I asked Climent about how he deals with this aspect of his practice. His approach is gentle and seems fragile but is in fact founded in a robust and honest methodology which is deeply felt. He says: ‘I think by nature I’m quite unsure, I found that by being challenged /encouraged helped me develop a means of problem solving in a visual way.There were times at college where I would get quite stuck, the tools I learned there to move beyond a certain limit were probably the most valuable I learned as an artist’. ‘For me painting is trying to find a balance between being unselfconscious, allowing the work to be formed and also making critical judgements about what work you want to make. It’s a process of doing the work and then reflecting on that work, seeing what has comes out of a period of painting and then deciding on and why certain paintings you feel are more successful than others. These paintings then become almost like signposts in the road ahead. They guide the series of work forward’. His words illustrate a poetic underpinning in his painting. He uses a critical process that exists on a continuum between narrative and form, emotion and objectivity. It is both felt and conscious and he has relied on it to provide the means by which to ground his commitment to painting. I remember once, in a conversation with Climent’s fellow Cork artist, Maud Cotter, she described how important it is to ‘consolidate’ your practice both conceptually and practically. Climent’s maturity in painting is mirrored in the evolution of his career and perhaps uniquely, has been since before he graduated. One of the great joys of looking at painting lies in observing how the artist handles colour. The abstract architectural structures in Tom Climent’s compositions shimmer in a place where green and pink meet orange, and russet red dances with purple-violet blue. Climent incorporates plaster into the larger canvases. In Mountain Machine, it forms a floating ceiling with the texture of cracked lava above a cool interior. Walls appear to shift and slide with dreamlike inevitability; their soft, blurred edges imply a slow, tentative settling that is far from decisive and yet unavoidable. Climent paints slanted roofs and gable ends that echo the ghosts of built structures, unfinished and disused. At the base of Monument to the Hereafter, plaster lumps mimic the rubble of disturbed earth. These non-places are a kind of everyplace, but carry special resonance in the context of post-building boom Ireland. In Artificer Transducer, the house form morphs into something less specific: an almost crystalline structure, no longer manmade Climent’s use of colour borders on the psychedelic. It’s risky but assured and instinctively right. He makes pigment glow. Baroque was a term frequently evoked when describing Climent’s pictures in the late 1990s and it was applicable not just because their theatrical manner so often evoked memories of the 17th century Spanish masters to whom the artist acknowledged a debt but also owing to their grandiose scale. Looking back on this work in 2005, former Irish Times critic Brian Fallon recalled how ‘ the tonality was often dark and sultry with splashes of brighter colour, suggesting a modernised version of chiaroscuro; the subject was not precisely figurative but suggested figurative themes.’ Early in the new millennium Climent’s work underwent a change, not least in scale since he began painting much smaller works on board rather than canvas as before. Furthermore while retaining their heightened lyricism his images became more abstact even as his palette grew brighter, the latter perhaps a response to periods of time spent in Spain where, like George Campbell several decades before him, he was struck by the difference between Irish and Iberian light. In 2006 Vera Ryan observed that Climent was now more influenced by Howard Hodgkin – the subject of his college history thesis – than by old masters. And while he has only on occasion reverted to painting on a large scale, his saturated colouring always retains its brilliance. ‘He is an innately good painter and a fantastic colourist,’ declared Cork gallerist Nuala Fenton in 2005. ‘His work is developing all the time, which makes him all the more interesting to follow…There is a real sense of energy and drama about his work, but there is also something very emotional about it and it’s very subtle.’ Fenton was right to note how Climent’s work is still developing as he continues to discover his own potential. Recent paintings tend to possess an architectonic quality with structures that seem to serve a religious function shown looming out of a mysterious fog. No longer a young artist, he continues to dazzle with his painterly pyrotechnics. Tom Climent’s Dust (Garter Lane Arts Centre, Waterford, March – April) was a salute to the cubist notion of the world, where a series of houses and structures were reduced to their near geometric basics. Climent however manages to manipulate this practical approach by adding a sense of foreboding with the buildings enveloped in a fog, a wraithlike isolationism. It’s a double-whammy, pure abstraction carries an emptiness at it’s heart, as it adheres to technique and formalism and Climent in adding this layer of mystery further removes the viewer from the work. But one is attracted to the mystery also. Like coming upon an empty old house, we question it’s abandonment and here is where our interest kicks in. We search for clues, fill in the gaps, make up the story. The paintings, oils on canvas, show houses, church buildings, lighthouses – some in slate greys, others bursting with effervescent colour as if the bricks and mortar are inhabited. Cill Patrick is oxidised copper and red with an errie white sky looming behind it; Capilla nestles a tower house precaiously on a horizon line, against a martian dusk. The yellow and reds of Sanctuary bleed from building into the outside, questioning interior and exterior. Although a work like Ashlar might suggest otherwise, it’s not to say that the geometricity of the buildings are the only thing being questioned. Climent is not engaged in storytelling so much either. It’s perhaps that the works are historical paintings and reflect the flux that buildings are always engaged in. Yes we have the strength of structure, pushed through in abstraction, bu we also have the doubt – even a spiritual doubt – that abstract objects might inherently have – that they can be returned by elemental forces (here at a stroke) to a non-existence. When the mist clears, perhaps they too will be gone. Tom Climent can create spectacularly dramatic paintings. With a characteristic and impressive use of chiaroscuro, areas of darkness are counter-balanced by vibrant colour. For him, the process of painting is both spontaneous and meditative, informed by his knowledge of art history yet not constrained by it. His art speaks directly to the emotions of the viewer, and avoids the predominant preoccupation of postmodern practice, such as irony, repetition, or references to popular culture. Climent’s early work consisted of interiors painted in a loose, gestural style, sometimes sparked by specific works of Caravaggio, Velasquez, Degas, and others. Over time a more abstract approach evolved, often using a staight edge in constrast to areas of flowing paint. The scale of the work increased steadily, culminating in Obscura(2002), which measures 9 feet by 5 feet. Climent’s father, the musician and composer Angel Climent, is Spanish, and as a child Climent often visited Spain. An extended stay near Malaga in 2003-4 led to the creation of smaller works in oil on board. This was the first time he had worked directly from nature, on the rooftop terrace of his house, overlooking sea and mountains. Works from this period –The Night of Ermina(2004) and Winter Light(2004), for example – are often divided by a horizontal plane, but are still closer to abstract explorations of light and shade than conventional landscapes. Marking a return to the preoccupation he had with 17th century painting a decade ago, Minotaur’s Piano(2006) is an enigmatic work wich seems to have taken inspiration from Vermeer in terms of approach to subject, composition and colour. Climent’s intense colour and intuitive composition remain a constant in his work, as he continues his exploration of the richly rewarding interplay between his subconscious emotional world and the physical process of painting. Just who will be the big names in tomorrow’s art world? Predicting who will make it in the art world isn’t easy. When we approached Nuala Fenton of the Fenton gallery, Kevin Kavanagh of the Kevin Kavanagh gallery, auctioneer and valuer Ian Whyte and portraitist James Hanley RHA for the inside track on who to watch, they were spoilt for choice. “There are so many good artists out there,” says Nuala Fenton. So who are the big names of the future? Nuala Fenton founded the Fenton Gallery in Cork five years ago, after a lengthy career in the arts including a 12-year stint at the Crawford Municipal Art Gallery in Cork. Now in his late 30s, he divides his time between Ireland and Spain. His work starts at €1,500, while larger pieces sell for as much as €8,000. “Tom Climent is an example of an artist who is consistent,” says Nuala. “He doesn’t take big price hikes and his level of productivity remains steady – he has a show about every two years.” Tom Climent recently exhibited at the Fenton Gallery in a group show with Sarah Walker. The Fenton Gallery stocks some of his work. TOM CLIMENT is a highly individual artist, still relatively youthful, who is rather out of step with current fashion and is all the better for that. Instead of playing cerebral games with his material, he paints for the love and also – I should say – for the fun of it. I have tracked his progress, intermittently, since I awarded him the Victor Treacy Prize some years ago, against talented competition. Since then his style has changed to a certain extent, outwardly if not in essentials. Broadly speaking, it stresses “painterly” values and broad, sometimes laden brushstrokes, and originally it had a certain, what I can only call neo-Baroque tendency. The tonality was often rather dark and sultry with slashes of brighter colour, suggesting a modernised version of chiaroscuro; the subject was not precisely figurative but suggested figurative themes. I had the impression, right or wrong, that he had been looking hard at Spanish painting, and perhaps at Baroque painting in general. His latest works maintain the painterly breadth and freedom, but the previous rather dark – and slightly sinister – subject matter has largely vanished and has been replaced by a type of self-sufficient and slightly enigmatic imagery. It is strongly suggestive in itself, as before, but gives no guidelines as to any specific “meaning.” These pictures, to state the obvious, are not “about” anything but are more or less self-generating organisms. They speak the language of paint and not the language of hackneyed association. It has not been an easy period for young painters, though the times are changing – much more basically and much more Quickly, in fact, than established opinion or established values would admit. Even as recently as six years ago, we were still being fed the familiar cant that painting as such had mostly become Old Hat and that conceptualism (much of it allegedly based on the example of Marcel Duchamp), installation ism and a multitude of other -isms had taken its place. Even photography, which had been doing all right on its own, was supposed somehow to be part of this New Wave. The art colleges opportunistically went along with the trend -indeed many of them actively propagated it, largely for their own ends. They, and a lot of others, now look like being left with mud on their faces. Painting is back – almost uncritically so in fact, as you can see from the auction prices paid for what is often no more than a rehash of hackneyed traditional styles. But of course, in reality, it never really went out – those born to paint just painted on, no matter what fashion said. Tom Climent is one of a generation which stuck to its guns and is coming into its own. Brian Fallon was art critic at The Irish Times until his retirement in 1998. He was a founder board member of IMMA, (1989 – 1995), and writes regularly about Irish Art. Tom Climent’s stunning degree show in 1995 showed great promise. Many degree shows do that but not every graduate is able to susain their practice or their promise. Nonetheless, many people were quietly optimistic about Tom and correctly so. Ten years on, his work is still enthralling and he has extended his vocabulary in new ways. In some paintings such as Martha’s House (1995), Black Supper (1995) or Honey Queen (1995) we see him excercising tremendous confidence. He was partly inspired by Jackson Pollock: ‘I woudn’t like Pollock that much now but there is heroic stuff that is appealing when you see him painting – the gestural stuff, the stream of consciousness. One of the most important things is that sense of creation. It is almost like you are not in charge. You are in a relationship with the painting that guides you. You never know wha is going to come out. I feel it requires a lot of discipline. I remember Jo Allen, my first real tutor, saying you have to turn up everyday. You never know when the magic is going to come. But if you are there you will catch it. Rather like Pollock, Tom often works partly on the floor. He does not work from life or from drawings, despite the years of life drawing he did with Jo. He often started the large canvases by hanging them on the wall, loosely blocking in the composition with acrylics. Later, he would put the canvas on the floor and pour on paint.. Harnessing his own emotion and the poured paint, his intuitive dialogue with the old masters would emerge in energetic sweeps of paint. Unlike many contemporary artists steeped in the process of quotation, Tom never dallied or juggled with his source. He worked away from quotation, so to speak, returning to it indebted for it’s anchorage. Many of the resulting paintings were breathtakingly beautiful. The scale was almost large and the music fast during those early years after graduation. That attunement to the imperatives of his practice results in paintings taking very different lengths of time to execute. For example, in Alexander and Sisygambis (2002) he had plannedto put layers and layers of paint on the surface. But having worked on the canvas on the wall he recognised very quickly that he had an image which ‘had that magic’. So he left the painting as it was. Two fgures, a leaping hybrid animal shape which has appeared in other paintings like Armistice (2000) and a small still one, had huge presence. He came across the names Alexander and Sisygambis in a book around the same time and felt they matched the work, without there being any need to probe the story for equivalents. His self distancing from narratives and archetypes is clearly important for his creatiity. By contrast with this rapidity of execution, Obscura (2002), which is 9’ by 5’ and is in the Cork City Council collection, took much longer to complete. He covered the canvas with a sap green first. He then held it upright and poured a dark industrial paint, which he had mixed up in large quantities, over the green. Literally going with the flow by turning a painting on it’s side also characterises the approach of the English artist Alexis Harding who also shares a desire to make emotion incarnate in the paint. When this treatment of Obscura was dry Tom brought in the reds. He was still uncertain. ‘It wasn’t my plan for it to be a landscape. I had in mind that very big Courbet [Burial atOrnans(1819)] in my mind. It would be the mood of it, or the tone of it I was after. That would have resonated within me. I wouldn’t look at the painting again. I would be trying to express the emotion that the painting aroused in me.’ The orange lights near the remaining green space suggest night lights. A dusty landscape had formed. In Buried on the ground(2002), figue and ground are fused. The gorgeous red, the red of pure pigment, glows and is made righter by the dark colurs surrounding it. These dark colours became like shadows, intensifying the drama, operating like chiaroscuro. This piece like Obscura pointed to a new direction in Climent’s work. It was the kind of studio he had in Malaga that helped as well in this new direction. It was effectively an outdoor studio – the roof of the house he lived in. As is characteristic of his practice, he had no preconcieved ideas about what way the paintings would go. But being surrounded by landscape and in a different environment, his work started to change from what was previously a mostly interior structure to a more external one. Inevitably, like George Campbell who painted in the area for several months of the year in the 50’s, 60’s and 70’s,Tom was struck by the difference between Spanish light and Irish light. In Malaga, the winter skies were blue all day and the light sharp. He was near the sea, surrounded by mountains. He found that the suggestion of landscape had become a major part of this new work. A more abstract sensibility began to structure these pieces, coupled with a heightened sense of colour marked this series out as a major departure in Climent’s work. As he prepares for the transition into the seond decade of his practice, it is tempting to see significant themes and motifs in the artist’s work. Climent is elusive in this respect. Would light and dark, literally and metaphorically, be his major preoccupation? Maybe mortality? But it seems established that he does not follow the model of the artist who mines a myth or pre-occuption to nuture his creativity. He adheres to the heroic model of struggling with the material, wrestling with the paint and doing so in a wholly un-ironic way. He may prefer to continue to trust the dynamic between himself and the painting process. It has served him well. Tom Climent’s paintings have an arrestingly luminosity. It’s a quality that reels in the viewer, compelling them to stop, and stare into the soul of his vibrant work. In recent years many of those in the know in the Irish art world, have tipped the Cork based artist as ‘one-to-watch’, but arguably Tom Climent has now arrived. A recipient of the Tony O’ Malley Award and the Victor Treacey Award, Tom Climent’s work already features in prestigious collections, including The Central Bank, UCC, AIB Bank, The Office of Public Works and NCB Stockbrokers, to name but a few. “From a young age I was always interested in painting and drawing. I remember seeing a painting by Matisse while at secondary school and knew that was what I wanted to do. I suppose Matisse has always been a huge influence, but other artists who have had an effect on my work include old masters like Carravaggio and Vermeer through to abstract expressionists, and more recent painters like Howard Hodgkin and Cy Twombly”. On completing secondary school, Tom opted to study engineering, but the attraction of becoming an artist stayed with him. “I started taking night classes in art at 17, in the Crawford College, Cork with the late Jo Allen”, he explained. “I continued with these night classes for four years. Jo was a huge influence on my becoming an artist, her encouragement and support was very helpful at a time when I was unsure about which direction to take, as were my parents who were understanding and supportive which was a big help, I eventually left engineering to pursue painting full time at the Crawford College, Cork”. Asked about his striking use of colour, Tom responded, “My Father is from Valencia, and I spent summers there as a child. I suppose the light and colour there has become part of my work, not consciously but intuitively. Recently, I have lived on and off near Malaga in Southern Spain, painting there and exhibiting the works back in Ireland. Spain is a part of who I am and this is reflected in the works that I have produced”. While Tom Climent’s newer works are more architectural, they still contain the elusive abstract qualities that have characterised his work over the years. According to Tom, “the architectural elements give my newer paintings a more grounded narrative”. “They are an amalgamation of structures, deconstructed and re-assembled. I have a desire to impose order and clarity on the abstraction that was evident in previous works, which has led to a more focused image in many of my current pieces. The works can declare a dramatic physicality while conversely appear to be quite subtle”. He added, “I have been trying to introduce the idea of a sacred space, embodied in the landscape”. Another notably difference in Tom’s recent work is that the scale has been reduced. “In the past I used only paint on a big scale from 5 feet up to 10 feet in size, I found it hard to distill what I was trying to do on a smaller scale, but since painting in Spain, where I work on a roof terrace, I started painting in a smaller scale”. However he hasn’t foresaken his large scale work. “Now I combine large pieces with smaller ones, to the point where I don’t see any difference between them”. Tom sums up his appraoch as ‘intuitive’. “I have a rough idea before I start a piece, but the painting process itself determines the overall look of the finished painting . The newer pieces are a combination of architectural structures with more organic elements.The paintings themselves are suggestive, I try not to describe something literally but instead allow the viewer make up their own mind as to what the painting is about. I would like viewers to have a personal emotional reaction and connection to the work. On another level, I’m trying to achieve a sense of light emitting from the canvas , that draws people into the space in the paintings”. Tom’s work has essentially stayed within the European tradition of painting, which is a “visual” one, concerned with picture space and the relations which pertain between the real world of three dimensions and the essentially illusory two dimensional world of the canvas. He admits, “This idea of creating space on a two dimensional surface has always been important to me, the conflict between representation and abstraction as a means of doing this has created a push and pull between these two elements”. Asked how he knows a piece is finished, he replied, “It’s something that comes with experience and instinct, there comes a point when you have to let go. Each painting is different, with different energies or personalities – you know you are finished when that individual personality and energy is formed”. Working as an artist is a notoriously difficult way of life and Tom is all too aware of the pros and cons. “Working as a professional artist can be great, you’re working for yourself, you’re your own boss, the time is yours”. But, he concedes, “the down side is it can be uncertain financially and to that end, it helps if you can build up good relatonships with galleries and collectors. I can go through periods of self doubt about the work though, which is all part of the process, it helps you strive to paint better. If you felt good about your work you might as well give up, it’s the constant questioning and re-evaluation that helps you grow as an artist”. 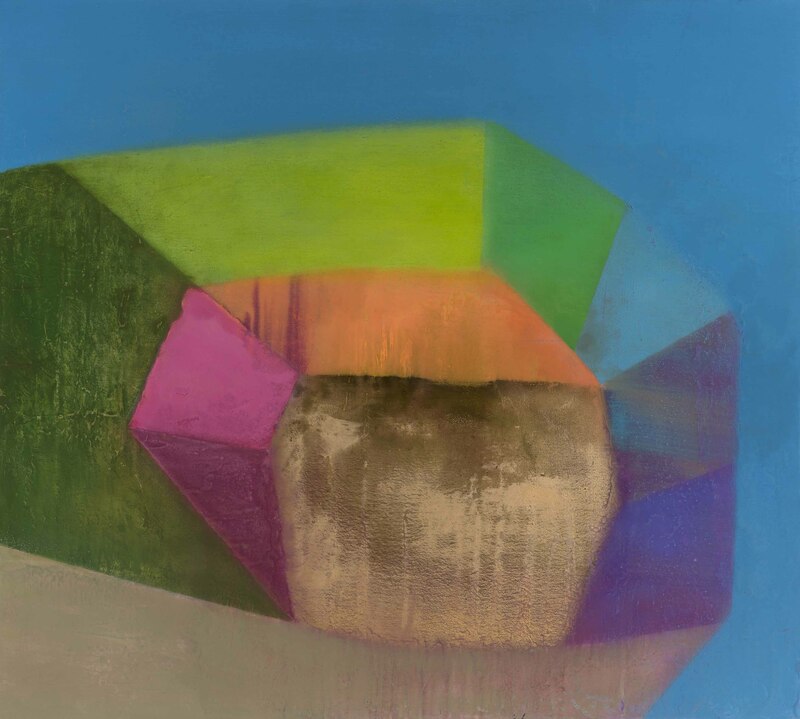 Tom Climent offers some sound advice to those looking to buy original art for their home. “The best thing you can do is to let yourself fall in love with a work of art. It is something you will hopefully have for a long time in your home, so you have to enjoy it”. He continued, “a work of art can add so much to someone’s living space , visit art galleries as much as you can, get a feel for work you like and respond to, ask advice from people you might know who have an interest in art, keep an eye out for open days in artists’ studios, and visit the end of year shows at art colleges”. TOM CLIMENT is known for the large scale of his painting, and his new show at Fenton Gallery Cork (Wandesford Quay, February 7 to 28) runs true to form. The largest work, Obscura, is nine feet by five, and several of the others have one side measuring six feet. I spoke to Climent shortly after the paintings had been trans-ported from his studio on Sullivan’s Quay to the gallery. It was the first time the artist had been able to view all 10 works at the same time, as there is not enough space in his studio to look at more than one or two. The show, which will also includes smaller works on paper in the vaults, represents two years’ work. Once again, Climent has produced an impressive body of work, that moves his painting forward into a strange realm, hovering between figurative, landscape and abstract. While he continues to admire the Old Masters; including Caravaggio, he is painting in a much freer way, and has moved towards a more modernist structure. This young artist’s work has been something of a sensation ever since the huge works in his degree show at the Crawford College of Art in 1995, which sold out immediately to established collectors and public venues. In 1996, Tom Climent received the Victor Treacy Award, and was chosen by art critic Brian Fallon to exhibit in a solo show at the Temple Bar Gallery the following year. His 1998 solo show, Dancing Parade, inspired by the work of Degas, at the Triskel Arts Centre in Cork, was yet another sell-out. Climent is a pleasant, modest young man, apparently quite unimpressed by his own success. He talks about painting with a passion. One work, Obscura, which moves from light to dark as the eye travels from left to right across nine feet of canvas, appears to be a kind of cityscape, or distant view of a port at night, a red sky above an half-lit area that recedes into darkness. Of it, Climent comments: “I wanted a big sweep, and a movement from light to dark. People see a city in it, and it certainly has a landscape feel to it. Like many of the paintings in this show, Obscura combines areas outlined by straight edges, with looser kind of painting. Some of the works use concrete, plaster or builder’s bonding material under oil and glazes. The unusual texture of the area of black in Obscura was achieved using house-hold paint. “The black is eggshell, from a hardware store, which I poured on to the canvas when it was on the floor, then 1 tilted it and let it run down. Pieta is Climent’s version of the traditional study of the figure of Christ removed from the cross, with a ghostly Christ at its centre. Venetian Concert is a bold symmetrical composition which uses the paint itself to suggest the scene. Doorway uses straight edge again, and shows the ease with which Climent fills a big canvas. Mark Ewart | Review of New Paintings | Fenton Gallery | The Irish Times | 2003Over a relatively short period of time, Tom Climent has achieved a considerable amount as a painter, picking up a number of high-profile plaudits along the way. What is most striking about Climent’s paintings is the way in which they declare a dramatic physicality while conversely appearing to be quite subtle in their ambition. The ‘action within appears transitional, a moment frozen, where the players have vacated the stage, and we are left in their absence to inhabit a strange, discordant place. Within these spaces Climent allows rich and varied paint surfaces to do battle. In the large painting Obscura, the subject appears to be a coastline setting rendered in twilight colours. In places, the paint is softly layered, allowing the canvas to glow underneath, but a menacing black rectangular shape, which covers approximately three-quarters of the painting, challenges this. In Venetian Concert, the paint is applied more thickly and has a molten property which conveys a lava-like surface – an appropriate metaphor for the energy’ within this exhibition. Now in its eight year, Cork Institute of Technology’s Arts Fest offers a diverse mix of activities including music, literature, theatre and film. On the visual arts front, four exhibitions are each scheduled for rather short runs, including an extremely evocative body of work by Ben Riley showing at the Sirius Arts Centre in Cobh. It is Tom Climent, though, who is the feature artist of the festival — a move all the more welcome considering that this exhibition is a return to from after his last solo show two years ago. Here we see again those bold and vital canvases which originally brought the artist acclaim. The art-historical references which informed earlier work were less obvious here, as other starting-points open up, most notably the serendipitous discoveries made during the painting process. In many cases, you would need inside knowledge to determine the exact origin of the imagery (although the titles offer some hints). That said, trying to impose order and clarity on the abstraction is certainly a vital part of the complicated equation that is Climent’s painting. Two series’ of smaller paintings stem directly from the compositions and colour schemes of the large works. It’s a useful developmental strategy that has borne some interesting results, particularly in the Beloved series, in which overtures to post-painterly abstraction are starting to creep in . This series shows Climent’s ability to exercises alternatives: on one hand, the paint can be deeply sensuous and vibrant; on the other it is a translucent medium which opens doors to intangible, disorienting spaces. Tom Climent was the featured artist of Cork Institute of Technology’s Arts Fest 200. His new work was at Gallery 44, MacCurtain Street, Cork, and consisted of five large works in oil and acrylic, two series of abstracts and a pair of watercolours. Since graduating from the Crawford College of Art in 1994, Tom has been painting full-time and his works, generally on a very large scale, are much sought after by collectors. The new series marks a change of direction, towards a more expressive less figurative style. Tom describes the work as a return to the works inspired by Caravaggio and Rembrandt that hang in the Farmgate Restaurant in Cork’s indoor market. Worship, the largest of the big works at 8’ x 6’, is a bravura performance, using paint directly from the tube in impasto to suggest the outline of a red kneeling figure and a blue lectern. The whole canvas is primed in acrylic in earthy tones which are then painted over in oil to create a background of considerable depth. The sense of space and depth of background is an outstanding feature of Beloved. The shape of a bed in an interior room is contained within an series of angles and shadows. A block of bright red in the foreground leaps out at the viewer, while a dark window in the background leads the viewer in to the picture. Bedrock features another bed shape, but the title indicates its ambiguity: is it a bed or a rock? Tom does not work from preliminary sketches, but prefers to paint directly on to the canvas, letting the paint and the way it flows dictate the eventual form of the painting. This process is evident in Baby Buddha, a study in luscious reds, yellows and orange, with its contrasts of round and sharp edges and its highly worked surfaces. The smaller, more abstract works in two series are based on small sections or corners of the larger paintings – variations on the same theme. But they lack the flow and spontaneity of the larger works. In contrast, Tom’s venture into water-colour, a new departure, is a very welcome change of direction. The two Golden Butterfly paintings have a lightness of touch that echoes the spontaneity and the delight in colour of the larger works on a smaller more intimate scale. CORK-BASED artist Tom Climent has been announced as winner of the inaugural Tony O’Malley Award at the James Joyce Centre in Dublin. Over 40 painters from north and south of Ireland submitted work to Kilkenny’s Butler Gallery with proposals as to what they would do with the £2,000 travel grant, meaning stiff competition for the young Cork artist. Runners-up Barbara Freeman from Belfast, who has been transcribing musical compositions by Cage and Messaien into colour and space, and Robert Armstrong, imaging water and in particular the frozen pond at the Botanic Gardens in Dublin, were present when the judge’s decision was made public. The Award, which will be presented annually, honours the 84 – year-old Kilkenny artist Tony O’Malley, who only recently presented a major exhibition of past and present work at the Royal Hibernian Academy. Sponsors of the award, Waterford Crystal, see their role of encouraging the visual arts in Ireland as an important one, and welcome the opportunity that the award will give artists to travel. Tom Climent, winner of the Victor Treacy Award in 1996, intends to put the grant towards a visit to Italy to study the work of old masters. Much of his work has been inspired by artists such as Titian, Tintoretto, and Carravaggio, and not surprisingly, since he is half Spanish, by Velasquez and Goya. He will travel to Florence, Venice and Rome and his named Velasquez’s portrait of Pope Innocent X in the Palazzo Doria Pamphii as a work – apart from the Caravaggios -that he particularly wants to see. MORE than almost any other artist emerging from Cork, Tom Climent has a loyal following. Even before he graduated from the Crawford College of Art in 1995, Tom was already exhibiting, and his large, vibrant canvases, influenced by Velasquez and Goya, were selling well. In 1996 he won the Victor Treacy Award from the Butler Gallery in Kilkenny and in 1997 the Tony O’Malley Award and a residency in Lithuania. To date, Tom has had work in nine group shows and held one exhibition in Dublin and two in the Blackcombe in Cork, but his latest, Dancing Parade, is his first in the Triskel Arts Centre. Familiar with his work and anticipating more of the same, the fans flocked to the opening last week only to find Tom had moved from the hot rumbustiousness of Spain to the cool stylishness of France: a new, flatter canvas, a lighter brush stroke, a quieter voice and a more mellow palette. Born in Cork into a musical family (half Irish, half Spanish) Tom Climent studied electrical engineering after school and his parents were alarmed when he chucked in his printed circuit boards for paints and brushed the year he was due to qualify at the CIT. Tom wanted to be an artist and he started his new path at the Crawford in 1991. Through his studies he was drawn to the painters of his father’s country and began producing interiors thickly worked in dark colours stabbed with bright reds and yellows, depicting life and lusty living in a style between abstract and figurative. Now 28, Tom has a good business head and is confident in his work; yet shy, never pushy, he sees himself as developing and moving on from what was a lucrative and energetic style and approach. “I follow my instincts and painting has to be exciting. I don’t want to be a prisoner of my work, I can only paint what I feel like painting and maybe I just got bored”, he says. “People say it takes 10 years to find a voice, I am only out of college a few years and am really only starting off, trying different stuff and different strands are coming together. The Triskel show, which runs until August 24, is an exercise in composition and structure influenced by Degas’ dancers. The paintings of abstract figures in interior aces are, in the main, smaller than Climent’s previous works, but he compensates for this by producing two series of four and nine paintings, saying that the scale is still the same but the details are just in several pieces rather than one big one. “The earlier work is chaotic, everything was all together”, says Tom, who wanted to take out and examine different aspects in sequence. He consciously wanted to produce a series and picked green – almost randomly – as a background colour from which to work, deliberately making the texture flatter so that the paint itself would not constitute a distraction from the images on the canvases, leaving only a miasma of their movement. Sometimes unsure how the finished series would fit together, he was delighted to find that the Triskel provided the perfect space for the result the was trying to achieve. There are 15 paintings but, in effect, only four when taken in series. The individual paintings cost £2,600 (four have already sold) and the series cost£2,000 each but the artist does not want to break up the groups despite the fact that it could hinder impulse sales based on love at first sight. Though he always likes figures in context, the dancers are not altogether important, the overall movement and composition is what matters. The work is subtle, quiet and reserved compared to his lusty and noisy Spanish-influenced work. Then he adds, somewhat uncomfortably: “I’m not mad about talking that much. I’d prefer people to come in and see for themselves”. He is actually echoing Edgar Degas: “The artist does not draw what he sees, but what he must make others see”. To say that Dancing Parade consists of a series of paintings inspired by Degas gives little idea of what an exciting achievement it is. Al the works are, broadly speaking, variations on that familiar image of the ballerina at the barre. Climent’s ballet dancer is more abstract than the Degas figure and is often suggested by an almost transparent play of planes and light as in The Swan Dancer, left. The studio is painted in shades of green and yellow, and a panel of light on the left appears to be a mirror reflecting light from a window. Dancing Parade, a series of four medium-sized canvasses in oil and acrylic, concentrates on the movement of the dancers, progressing towards an ever more simplified mode in which the figures become less clearly represented, more implied. The triumph of the show is a series of nine paintings that start and end apparently as abstracts. The “abstract” is revealed to be grounded in a detail of the now-familiar studio, which materialises before our eyes, and is then taken away again. The series is a brilliant illustration of how an artist creates illusion and moves between apparent abstraction and representation. Brian Fallon talks to Tom Climent, the young painter he nominated to exhibit at the Temple Bar Gallery, and last year’s winner of the Victor Treacy Award. Tom Climent’s one man exhibition is virtually his introduction to Dublin viewers; his career up to this had cenred on Cork, his native city, where he still lives and works. The breakthrough came with last year’s Victor Treacy Award in Kilkenny (incidentally, I was the judge on that occasion) which he won from an exceptionally strong entry. His present show is a direct follow – on from that. Climent was born in 1970, the son of a Spanish father who came to Ireland in 1960’s and an Irish mother. His father is a piano teacher who also plays as a professional musician, and his mother met him through attendance at his piano classes. Climent is the eldest of of their chldren -he has a brother and a sister – and went as a schoolboy to Rochestown College. After school he studied engineering for three years, “but I gave it up in degree year for painting. Why did he do so, and at so late a stage? “Well, I had been going to night classes in painting since I left shcool and I felt that it was really what I should be doing”. So he went to the Crawford School of Art, where the talented Jill Dennis was his degree teacher and Vera Ryan taught him art history. He admits : “I found college hard enough, becauase I didn’t keep sketchbooks or any thing like that. In fourth year I had a studio separate from the college, where I had had enough of college and I just wanted to be separete from it”. The influences of Spanish and Italian art (both Baroque and Renaissance) on his style seem obvious enough, and as a boy he and his family used to visit Spain almost every year. Since then he has been to Florence and Venice; he currently plans to visit Rome as well. Climent reckons, however, that his response to modern art began at school when he was reproductions of some works by Matisse – “they kind of regstered with me. But it was a long time before I felt that this was what I wnated to do. Maybe I had always felt that I would end up doing painting, but it was largely a matter of confidence. “Painters I used to like at the start were Matisse and Bonnard. In second year I was more into painters like Diebenkorn and Joan Mitchell – I was really into ‘painterly’ people! Though I suppose that I knew their work more from reproductions than from the original. In my fourth year, too, Paddy Graham had a show at the Crawford. They were big pictures, and the sparked off something in me – they had that power. “The Abstract Expressionists, the actual way that they painted, on a big scale and with such attack -that draws me to them. But I have never seen their paintings in the origianl , except in London some years ago. The de Koonings which interest me most are the one he painted when he moved out into the country”. He also admires Francis Bacon, while admitting that he does not care for Bacon’s use of paint. “When I began, I just painted in the bedroom at home, on anything I could get. It was not until third year or so that I began to work on a big scale, I find, I use house brushes and things like that, and I work with the canvas laid out on the floor. I painted in acrylic first, then moved into oils”. He does not work from sketches but prefers to attack the canvas premier coup, a teachnique much used by Baroque artists. Climent works at his painting full time – he produces about 15 pictures each year, on average – and doesn’t think he could paint and keep a full time job : “I have no ambition to teach.” But he does permit himself occasional breaks – “ I might start take two or three months off, then I start to paint again. It helps to switch off for a while, and then paintings will slowly start to form in your head. At least, that is how it works for me”. He would like to travel and see more paintings in other countries, but he had no wish to live or work abroad, and America does not seem to interest him particulary. The drama and scale of Ventian and Baroque art he finds inspiring, “but I would like to move on to the next thing, take what I have learned and move it on a stage further. I like to think of my work as a two dimensional space that I can play around with, move it around … that is what draw me into painting. Those in search of the heady, sultry feel that kinder climates evoke shouldn’t rely on the cantankerous Irish climate; a visit to the Temple Bar Gallery and Studios next week is a far better option. Tom Climent is a young artist for whom many are predicting great things. Small wonder. At a time when the work of many young abstract artists is depressingly terse and grim, his exuberant , larger than life canvases, awash with colour and flamboyance, provide a breath of fresh air. It’s difficult not to eulogise Climent’s work’ lush and rich, it moves miles from the stark abstractism favoured by so many painters. His work is mature and self-assured; hard to believe this 26-year old graduated two years ago. There is no sense of the austerity and bleakness characteristic of many Irish artists, abstract or narrative. Instead, the glorious, rich colours splashed across giant canvases create baroque, extravagant works. His exhibition in Temple Bar Gallery and Studios, which opens on Thursday, contains around half a dozen works selected from 16 canvasses. The exhibition will be opened by critic Brian Fallon, who has been one of Climent’s most enthusiastic champions. The final selection was unclear that the time of going to press, but a review of the entire collection revealed newer works which are more complex in structure. Not all of it will please everyone; I had serious doubts about two newer works which featured with oils, one, A Love That Blooms, is bedecked with tatty artificial flowers, the other entitled Pin Pick, with sewing pins. The remaining dozen or so more than compensated – lavish splashes of ochres, blood reds, burgundys and greens create movement between the abstract and the figurative. Climent describes his work as abstract with a narrative structure, which sums it up nicely. Climent uses both oil and acrylic, painting on several acrylic layers first. What looked like large squelches of oil paint on canvas were in fact a sort of resin painted over with oil; they added to the luxuriant feel of the works. Even the titles are flamboyant and seductive, conjuring up images of sultry weather, tempests and South Seas; Near Wild Heaven, Voyager, Revolution, Martha’s House, Your Blue Room and Spanish Elegy. However, one of my personal favourites, Betrayed, with strong Caravaggio influences, was awash with melancholia, in stark contrast to the sensual hedonism evoked by Spanish Elegy or Near Wild Heaven. Your Blue Room was another variation on a theme. Its Mediterranean blues showed a cooler, more restrained hand. Climent hasn’t wasted much time making an impact; he graduated from the Crawford College of Art and Design in Cork two years ago. Since then he has had solo shows at Blackcombe Gallery, University College Cork and the Triskel Arts Centre, plus a number of group shows in Cork and, strangely, Lithuania; aside from Lithuania, where his work featured as part of a group exhibition, this is his first major show outside Cork. His work reflects little influence by Irish painters; he claims Goya, Titian, Caravaggio and Velasquez as his chief influences – it shows in this lavish use of paint and colours which give his work an extravagant and sensuous feel. Isobel Smith, the eagle-eyed agent who has provided a short of adrenalin to the careers of other young artists like Brian McCarthy or Clea Van Der Grijn, has added Climent to her stable. According to Smith, who plans to take his work to England and the United States, such is the demand for his work that all finished work is now sold and there is a hefty waiting list of clients queuing to buy future works. This exhibition sold out weeks before it opened. The exhibition is part of the Art Critics Prize, which Climent holds at present, and which entitles him to a solo exhibition in the gallery. Although the gallery may provide a backdrop which is a little austure for his work, this exhibition should not be missed. Climent is definitely worth watching. One could be suspicious of the amount of hype surrounding 27-year-old Cork artist Tom Climent. After all this is his first show in Dublin and he is only two years out of the Crawford College. But that wouldn’t be fair. Having seen the exhibition in the Temple Bar Gallery I see what the fuss is about. While Climent himself is quiet and reserved, and apparently uncomfortable with the attention, his canvasses tell a different story. Vibrant and luscious layers of colour, semi-abstract, semi-figurative, these paintings possess a confidence and self-assurance that belies his lack of experience. “The paintings are my alter ego”, he says “They enable me to express myself. I want people to walk into a room and just want to look at them”. Tom Climent is from Douglas, Cork, where he has his studio. He started painting while still in school after becoming mesmerized by a Matisse picture. After school he studied engineering for three years before finally coming around to the fact that painting was what he really wanted to do. For four years he studied at the Crawford and has had two solo shows in Cork. Last year he won the Victor Treacy Critics’ choice award which resulted in the current show. “I’ve been working at it ten years but it is only in the last two years that things have begun to happen”, he says. The provocative hedonistic titles like Near Wild Heaven, Your Blue Room and Spanish Elegy became the inspiration for the paintings. Sometimes I read something in a magazine or a book or hear a line from a song and think that would make a nice title. Then I start to think about the painting but it is the actual process of applying paint that works out the painting. “I think you have to have a hunger to pursue a life of painting because financially it’s very difficult. Once I made the choice there was no going back. The hype doesn’t really make any difference to what I do. Selling is great (most of the show sold before the opening) but it’s not why you do it. That’s why it’s good that I live and work in Cork. It keeps my feet planted firmly on the ground”. Artist Tom Climent is the winner of the Victor Treacy Award for 1996. The Best Emerging Artist was chosen by Brian Fallon and announced at the Butler Gallery in Kilkenny. Climent was one of six young artists invited to exhibit at the annual award show which is a showcase for young emerging artists, sponsored by Carlow business man Victory Treacy, of Victor Treacy International. Tom Climent grew up in Douglas, Cork. He studied at the Crawford College and has exhibited two solo shows in his home county, and has also participated in a number of group shows. He said that his immediate plans are to “get back to work”, and that he hopes to have a show in Dublin next year. While opening the Award Show and announcing his independent decision, Brian Falon had a word of praise for each of the exhibitors. It has been a very difficult decision. It is a most even show. But I must put my neck on the line”. Before announcing the winner, he added: “I don’t mean to devalue the other artists”. Also exhibiting at the award show in the Butler until December 8, are Sarah Walker, Oliver Comerford, Suzanne Chan, David Quinn, Fiona Joyce and Michael Canning. As to the quality of the country’s emerging artists, Brian Fallon asserted: “There is an enormous amount of promising young talent in the country today. We are becoming more visually aware as a nation”. When asked what the future would hold for the show’s exhibitors, Fallon replied: “As to how far they go after this, well it’s the Devil’s Glen… But in terms of the quality of emerging talent in the country, it’s never been better”. George Vaughan, a director of the Grennan Mill Craft school claimed that this was the best award show ever, it was a “joy to behold”. TOM CLIMENT is only 26, yet is beginning to make a mark for himself as a painter. I was studying engineering and attending night classes in painting at the same time, when suddenly it just seemed to make more sense,” he says. “At school I enjoyed painting, but I didn’t feel I was good enough to do it full-time, but then I found I was spending more time at it than anything else”. He studied at the Crawford College of Art from 1991 -95. His work is strongly influenced by Spanish and Italian Masters. “We used to spend nearly every summer in Valencia, so perhaps that did have some effect on me”, he smiles. Last year Brian Fallon selected Tom for the Victor Treacy Award, for the best emerging artist in Ireland. And also picked his work for his recent Critic’s choice Exhibition n the Temple Bar Gallery. “They’re all kinds of interiors, three dimensional spaces, and there’s a story in each of my paintings but it’s ambiguous, which forces people to look at them more. There are semi-abstract figures in some of them. ”Though he feels he’s been influenced by artists like Goya and Carravaggio, he sees art as a contiuum and admires Matisse ad Bacon too, “though maybe not for their subject matter. What interest me most is the how”. Tom likes Cork with its ‘small community of artists, all of whom know each other’. He has his own studio in the city, and enjoys meeting other artists regularly, particularly the Blackwater studio artists. He particularly admires painter Maurice Desmond, and he very much enjoyed studying under Jill Dennis and Vera Ryan. “It’s funny really how you move on. Now when I see my paintings in Temple Bar I don’t feel the same about them. Maybe it’s because I know they’ll go to whoever has bought them. It forces me to do something new”.